Recently, I found a Pirates of the Caribbean for sale a couple hours away. A friend and fellow pinball-collector, Marshall and I made a trip to Mississippi to get it. I wasn't really looking for a Pirates but the prospect of a well-priced Home-Use-Only machine within driving distance was too good not to check out. My whole family is all about Disney and love the ride, so it seemed like it would be a good fit for our game room. I usually expect pinball machines to be in a condition that is less-than-advertised. I was surprised to find this machine was more-or-less as described. It had 1700 plays and was running original game code. There were a few issues but I don't think the owner even realized them. The first thing that I noticed was that the DMD was "off'. Some screens looked fine, while others seemed jumbled. It seemed like the screens that used the most dots where the ones that showed the problems most prominently. I hoped it was just a connection but the data connection to the DMD was quite solid (and hot-glued). PinballLife.com carried a perfect, drop in replacement for this older-model stern game. It was about $100 and worked perfectly. While we were playing the game, I could hear a coil energizing but didn't immediately work out which one it was. As it turns out it was the right pop bumper. Once we got it home, after a few games played the machine started to pop Fuse F8 immediately on powerup. Using the coil matrix I unhooked everything on that fuse until we found the right pop bumper coil to be fully seized. The replacement coil (a $12 part), I already had but after replacing it I noticed it stayed engaged whenever the game was powered up. The coil matrix charts in pinball manuals are super handy in showing you how your coils are switched and where they get their power. In this case, Q10 was the driving transistor. Since the coil was stuck energized, I replaced the Q10 transistor. Stern electronics are incredibly reliable. I was reminded of why this in trying to remove the transistor. The board solder took quite a bit of coercion to get heated enough to pull the old transistor. I added warm-white Cointaker Retro LEDs to the inserts and some green spotlight LED's to accentuate the ship and Kraken. 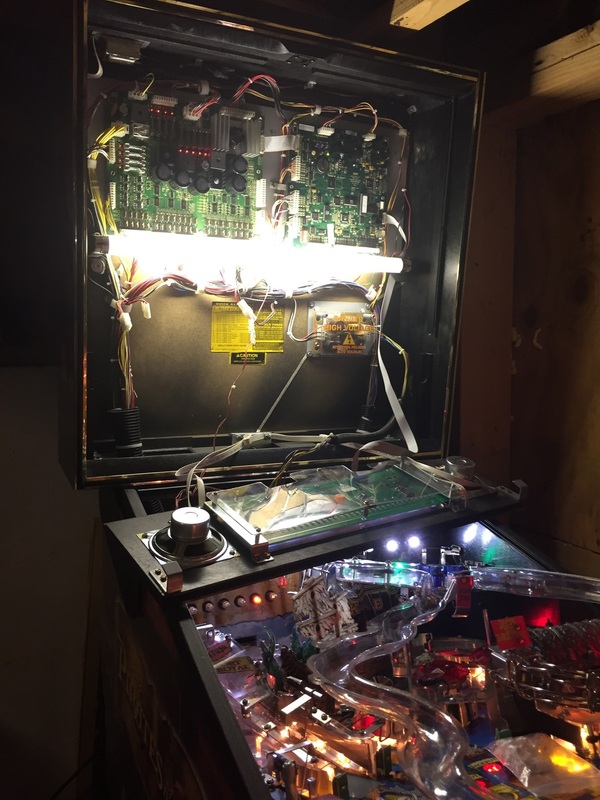 New playfield glass, replaced DMD, a coil and a transistor, Cointaker LED's and red super-bands. The end result turned out pretty good! In this photo we are still using Incandescents in the GI, I'm experimenting with various LED's to try to retain that 'candle-lit' quality that is pervasive to the ride and the movies.